Seven Cups offers private, one-on-one courses of tea education. Each class is tailored to the specific interests and experience level of its student. These courses are designed for industry professionals and passionate non-industry students who are interested in gaining an intricate understanding of Chinese tea. If you are interested in enrolling, please contact us. Below is a schedule of personal tutorials and consulting services offered by Seven Cups. We suggest arranging no more than four sessions of lessons per day to allow yourself some time in-between to absorb the information. Learning to judge different grades of tea. $200 per session, $180 for Tea Club Members – sign up here. Sessions last 1.5 hours for individuals, 2 hours for groups (maximum 4 people). These classes are ideal for tea enthusiasts of all ages who want to learn more about Chinese tea and tea culture. Students can pick a category of tea they are interested in for the session’s focus. Each session includes a guided tasting with information about the tea’s history, traditions, lore, and methods of processing. The student will also learn and practice techniques for brewing and evaluating fine teas at home. Learning a tea ceremony for wulong tea. Individual instruction, 4 hours. $300 ($270 for Tea Club Members). Group instruction (maximum 2 people), 5 hours. $500. This course is divided into two sessions, each lasting 2 hours. The student chooses which type of tea ceremony they wish to study. The first session is an in-depth explanation of the utensils and precise movements used in a specific style of tea ceremony and their significance. This is accompanied by demonstration. The second session guides the student through practicing the movements of the ceremony with the coaching of the instructor. All necessary materials are provided and are included in the cost of the session. Students can select from the following tea ceremony styles with different teas. 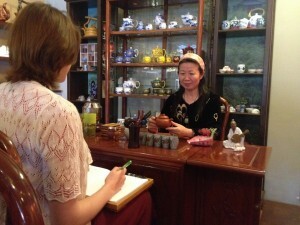 If you wish, the instructor can help you choose a style based on your favorite tea. Individual or group, 1 hour. No charge for students of above classes. Contact us for pricing. An additional consultation for individuals who are interested in launching their own tea business. We will discuss ways to select and structure your inventory for efficiency, stability, and quality control. 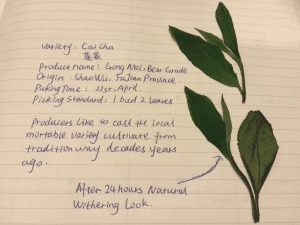 HAVE AN INTEREST IN LEARNING ABOUT TEA IN CHINA? Designed to be a masters class in Chinese tea and tea ware taught through first-hand interaction, we meet with the growers and makers of traditional Chinese tea on uniquely guided tours with access to some of the most inaccessible regions in China. Many students travel to learn-first hand on our tea tour. Studying tea the fields near Guzhu Village with 70 year-old tea master tea maker Pei Wen Feng.